Don’t these two Halloween pieces have the greatest vintage vibe? I bought them both at a thrift store last week. The pumpkin on the left is not a thrift store find. He was jealous of the giant pumpkin on the front porch and insisted on being in this photo shoot. This kitty cat has a bar code sticker on the bottom, so pretty sure he’s not really from the 1950’s. He only cost 50 cents at the thrift though, so that makes up for his youthfulness. No bar code here, but no date or maker either. It has a UL mark on the back and tells you what wattage bulb to use (7.5 watt in case you were wondering). 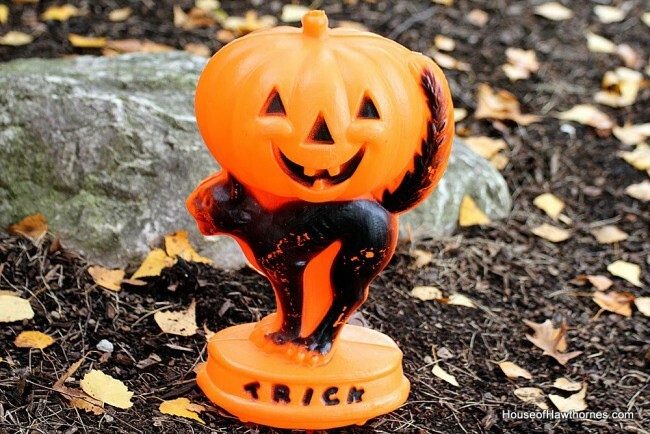 Still cute for $1.91, so I decided to start my Halloween blow mold collection with it. Gotta start somewhere. I also found this tool tote for $2.92. 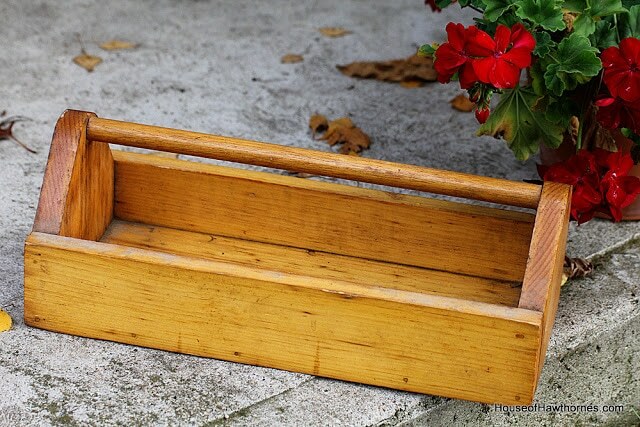 I will probably paint it up and stick some baby pumpkins in it for Fall. My favorite thrift store was PACKED with Halloween castoffs last week and I’m hoping even more comes in this week. True vintage Halloween pieces are so hard to find, but I’m not giving up. There’s some Great Grandma out there just dying (maybe literally) to get rid of her Halloween noisemakers she had as a kid. Have you found any neat Halloween stuff at your local thrift stores this year? 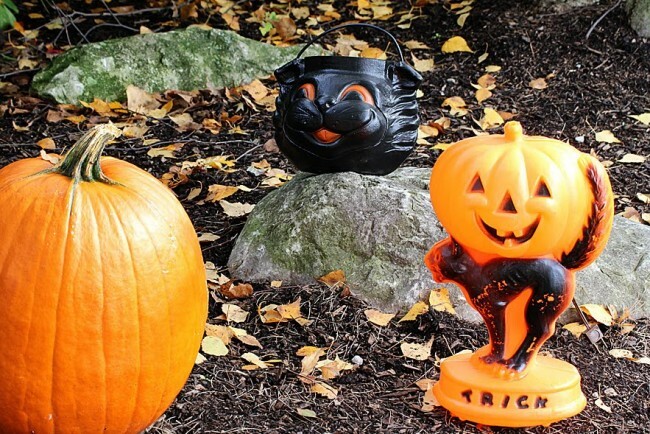 That pumpkin on the cat does remind me of the Halloween decor of days gone by. What great treasures you’ve collected! It’s definitely looking like Fall at your place. I love it! 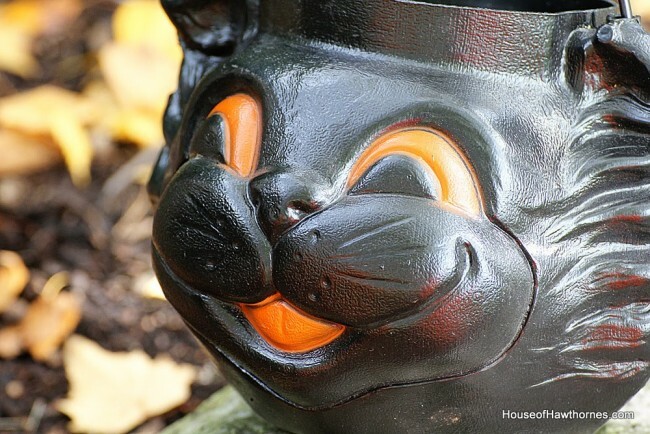 If you ever get tired of the black cat and pumpkin blow mold…I’ll give it a good home! I like the black cat. I can only find Halloween items in the off season. Same goes for all the other holidays. You got lots of goodies. Will you be at Urban Society tomorrow in the rain (hope it doesn’t rain). I remember you saying someething in the past about going to one of Granville’s Antique Fairs…….there was one last week-end. Don’t make a special trip…..it was so overpriced. Those are really cute halloween things you have found. I love the idea of putting the small pumpkins in the tool tote. You’ll have to show us when you’re done! I love your finds!! So jelly! I recognize that blow mold! I promise you won’t be able to stop at just one (smile). Great finds! Halloween hugs! Great finds!! And, of course I’m curious … where DO you go thrifting? Debby – I’m going to try to go, but my son has been home sick from school all week, so it all depends if he is good to go to school tomorrow. Nancy – Volunteers of America is my favorite. Salvation Army is 2nd best. I have no luck at all at Goodwill. Obituary: Stella Parsons died Monday at the ripe old age of 100. Funeral Wednesday. Estate Sale Friday. Now, wouldn’t that one handy to combine obits and yard sale ads in one place? i really like your halloween decor, so cozy. I bought a vintage witch costume last year for my dressmaker’s form and haven’t even thought about it until now. Ta da! Blog post. hehe. Love the little cat. Happy hunting, or should I say haunting! Just saw you won the Amazon giftcard–congrats on that! Love the cat. Even if he is not very old, he definitely has the vintage look and I would have snatched him up too. Good finds! Very neat pieces. I remember things like that. Very cute and very vintage looking. Oh so cute Pamela. Great finds for sure. I love the kitty- even if it is a repro. My kitty head in my cabinet that you commented on is also a repro, but I don’t care! I’ve seen Halloween blow molds go for $10. Good steal! I got a bit behind on your blog. Now I am all caught up. It is looking very Fallish here. SCORE!!!!! they are both adorable. I just love vintage halloween stuff. Cute vintage look Halloween things. I love vintage pieces, but had to do a “faux” vintage look this year. Maybe next year, I’ll find some oldies.